Special features: Only 100 years ago this ragged looking butterfly was almost extinct in Britain. The reason for its decline is still a mystery, but from 1830 to 1920 sightings in the southern counties of England were reduced to just one or two. It wasn't until around 1930 that numbers started to increase. 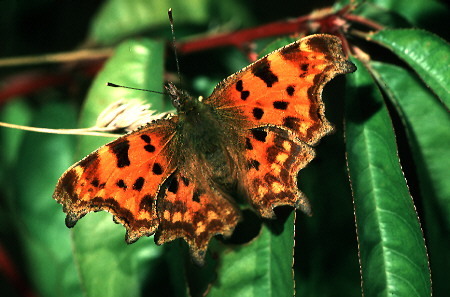 Today the comma is a familiar sight in southern England and Wales. The underside of their wings are a dull brown colour, with a small white 'C' shaped marking, which gives the butterfly its name. During winter they hibernate on the lower branches of trees. With their wings closed they resemble a dead leaf, and can remain perfectly camouflaged throughout the winter. In earlier years, almost every village had a brew-house, with a field of hops close by, and the hop was the favourite food plant of the comma caterpillars. The caterpillars are black and white in colour and resemble bird droppings. It was the caterpillars affinity with the hop fields which earned them the nickname of 'hop-cats'. With fewer hop growers around today the caterpillars have to make do with stinging nettles. Size: Has a wingspan of around 45mms. Months seen: April to November.